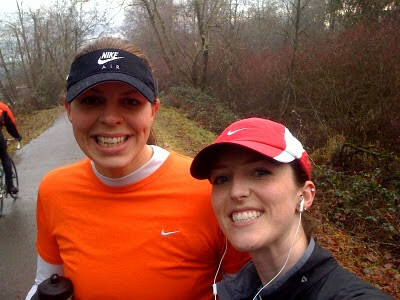 Started training with Fleet Feet and put in some major miles with my little buddy Zoe. 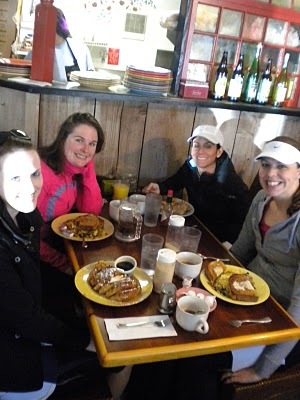 Had a super Breakfast with Emily, Zoe and Janna.. The FREE Million Inch Run on Valentines Day.. Whose idea was that?? 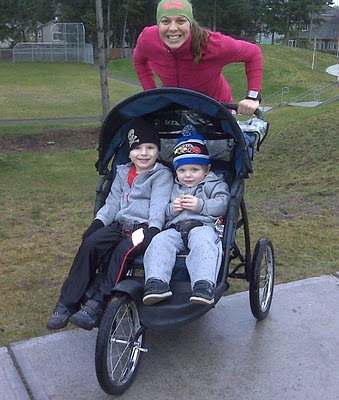 Hmmm.. We had a blast and did it in STYLE..
Running with our Little Studs is always a highlight.. Ran the Mercer Island HILLY Half Marathon, could hardly breathe and shut down at mile 11..
Post Race with the whole group..
Janna AKA Lioness became a dedicated training partner for miles and miles.. we did 23.3 on a hilly and cold day last long run before my GOAL Marathon. Was in the ZONE and executed a GREAT GREAT Marathon with the help of many Bloggy buddies advice and support. Special thanks to Bethany, Aron, Katie A and Jill for your BQ Advice.. 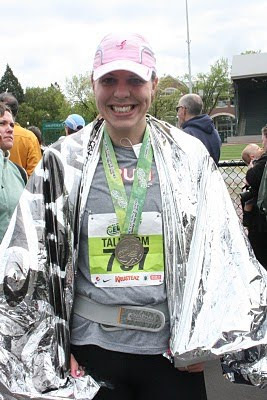 I crossed the line in 3:37:06 good enough to Qualify for Boston.. BELIEVE!! Still tired from Eugene I had hopes of becoming a Marathon Maniac so I ran the FREE Green River Marathon. It was HOT and tough, but I did it!! 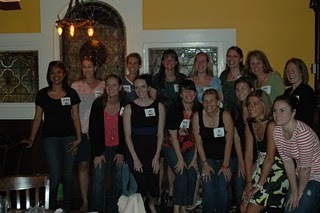 Some amazing Bloggers came to town for Rock N Roll Seattle, so I set up a little Bloggy Meet up!! Thanks to ALL who attended, what a FUN night!! 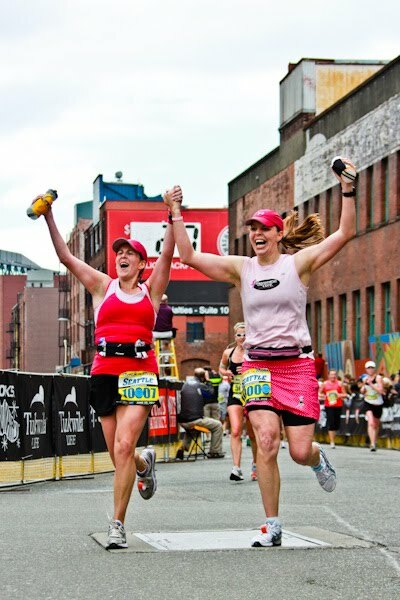 Marlene and I, deemed team "Pretty in Pink" had a fun race and even made front page on the Marathon website with the pic above. ROCK N ROLL is right!! Shortly after I took some time to welcome my friend Jill to the Marathon club, such a neat experience to be with someone just after they have reached a lifetime dream. Paced Muscle Man in a 5K, he was SWEATY after.. I took 4th in my Age group without racing..
We lost Muscle Man's Dad Ron on August 18th, most of August Muscle Man was out of town which DERAILED any running plans. I was sad, tired and pretty hopeless. Thankfully I had the friendship of Tammy and her spirit. 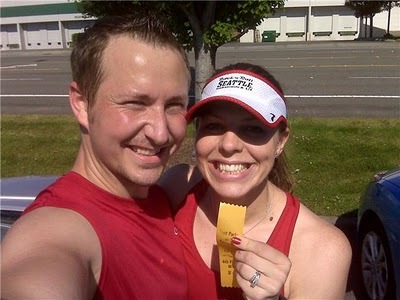 Jill and I decided to race Amanda Style and sign up for the Super Jock and Jill Half Marathon on a whim. I had not run much in August so I thought it was a GREAT opportunity to pace Jill. FUN FUN FUN race which resulted in an 8 minute PR for Jill!! 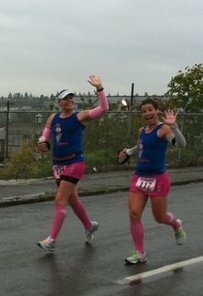 Team Will Run for Ice cream looked pretty on a soggy day in Tacoma. The tank tops did not fair too well in the rain, sorry gals! 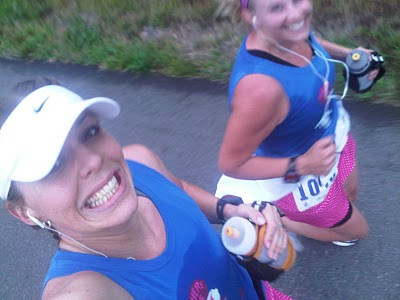 I love all female races and meeting new people..
Flexing more pacing muscle TMB came to visit.. We started a little fast on the hills, OOPS.. 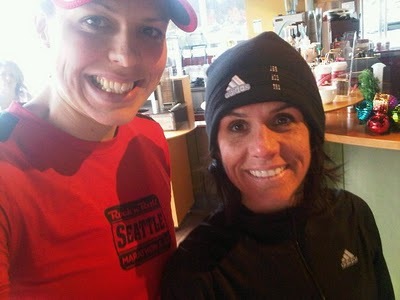 But at the end of a TOUGH day T had a sub 2 hour and PR performance..
Stacie organized a Blogger Meet up in Portland. Was great to see Harmony and meet Jess.. Jill and I spectated the WET Marathon and felt for our soggy buddies.. We support Amanda on a hard day. Soon after Portland on 10/16 was the worst day of my life. My Father John passed away due to an undiagnosed heart disease complicated by Pneumonia, he was 59... It was unexpected and none of us got a chance to say Goodbye. 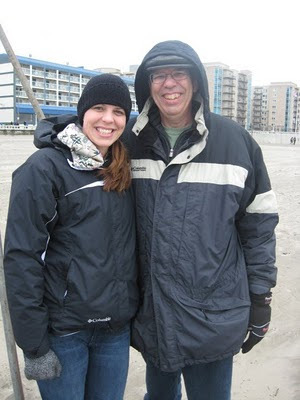 My heart is puzzled right now, a large piece of me died with my Dad. I get my smile and humor from him...the world is a bit darker as I struggle to find the light.. 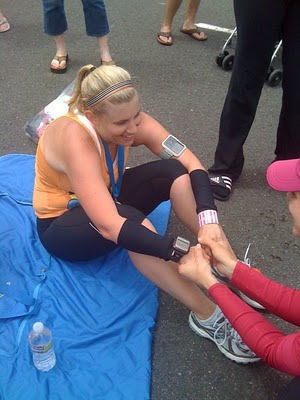 I thought it was a good idea to run a Marathon untrained...hmmmm?? 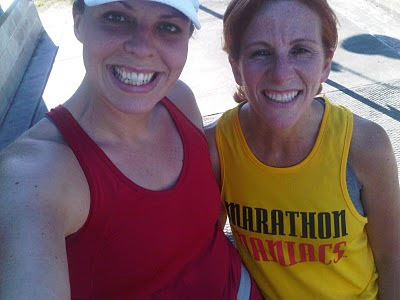 So my friend Janna laced up and helped me survive a 20 miler. It was tough, but we laughed our way over the wall. 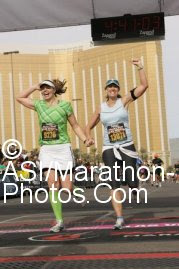 Las Vegas Rock N Roll Marathon for Amanda and my Dad. It was TOUGH!! But I felt blessed to have time to spend with a dear friend who moved away. I have a feeling we will meet in future destination races, right Amanda?? I will try not to puke on my medal next time.. I have not listed everything....but you can always click on the months and read back posts.. I also have direct links to all of my races on the right sidebar if you would like to read the race reports. Thank you ALL for joining me through the ups, downs, joy and tears.. 2010 will not soon be forgotten but I am VERY READY to start 2011.. Tomorrow?? 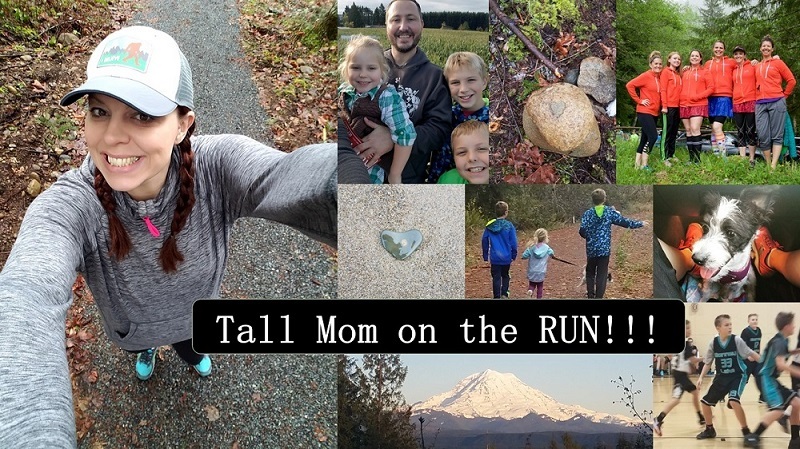 The Tall Mom 1,000+++ Club Recap with some pictures.. please update your miles ASAP! And for those of you who want to join in 2011, look for a post on 1/3.. It was a big year for you, in good and bad ways. You are one of my running inspirations. Here's to hoping 2011 treats you well in all the ways you want it to. Such great losses in the midst of such great accomplishments. I pray you find your light in 2011. Great recap. I hope that 2011 is a much happier time for you and your family! Will continue to keep you in my prayers. Great Pics and recaps. Good Luck in 2011! So honored to be in several of your pictures, Mel. It's been so great getting to know you. You are such an inspirational person! You've had a very exciting and difficult year. I hope 2011 is not so difficult and still exciting! Love the photos! Happy New Year Mel! Looks like there were a lot of highs and lows in 2010, looks like you kept your spirit through all of it. I hope 2011 is joyful for you and your family. You have really had a lot of ups and downs this year. You had a lot of hard times but you also accomplished such GREAT things!!! Hoping for a better 2011 for you! Mel, such an illustrtive post for your 2010. You can feel the joy and heart break in the pictures. I am wishing all the joy and happiness in 2011. You deserve the best as you inspire so many of us reading your blog. I'm so thankful I got to meet you and look forward to running with you sometime soon! I will be cheering for you as you train for BOSTON!! What a year, Mel!!! What a year!!! What a (mostly) fantastic year. I feel truly blessed to have been a small part of it. I will never forget the friendship we have formed and the awesome weekend we spent together. Thank you SO much!!! Your year definitely had its ups and downs but you finished it with a beautiful smile on your face! :) You should be proud of that! Happy 2011! Love the year in pictures! I hope, though, that 2011 doesn't have anything as sad as 2010 in it. You are amazing and I hope you are able to fill a little bit of that hole that was left sometime this year. Keeps those jokes and that smile coming because that's what you dad would want. Cant wait to meet you in Boston! What a PHENOMENAL running year! Great pictures - smiles! Love, hugs and prayers go out to you and your family for the loss of your father and father-in-law. I can only imagine how devastating it must be and I hope that 2011 can bring you some peace and healing. great running year! looks like you always have so much fun! will there be a team icea cream again in september? if so, i want in!! lol, i love the february picture from the million inch run, the guy in the background is hilarious. was he trying to be in the picture? or do you think a child is about to run into his arms? thanks for sharing your ups and downs on 2010, i got a little teary eyed there! I can't believe that wonderful year with you was almost a year ago! 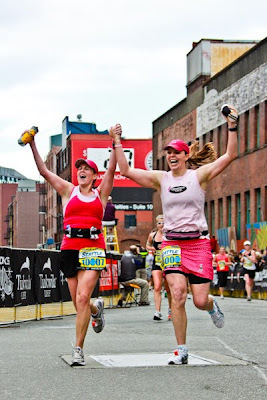 You managed to pull off an amazing running year despite the setbacks and emotional trauma. Big hugs and PLEASE can we run together in 2011?! I love this post. YOu have a great way of sharing your life with us. You faced a challengening phase of life but you lived an amazing year and because of those challenges you are an even stronger person/mom/wife/daughter/friend and runner.